Big, Fat Stereotypes Play Out On The Small Screen From The Honeymooners to The Biggest Loser, television has rarely dealt sensitively with issues of weight. As part of an ongoing series on obesity in America, Alex Cohen explores the limited number of roles for overweight actors — from "bumbling husband" to "sassy best friend." 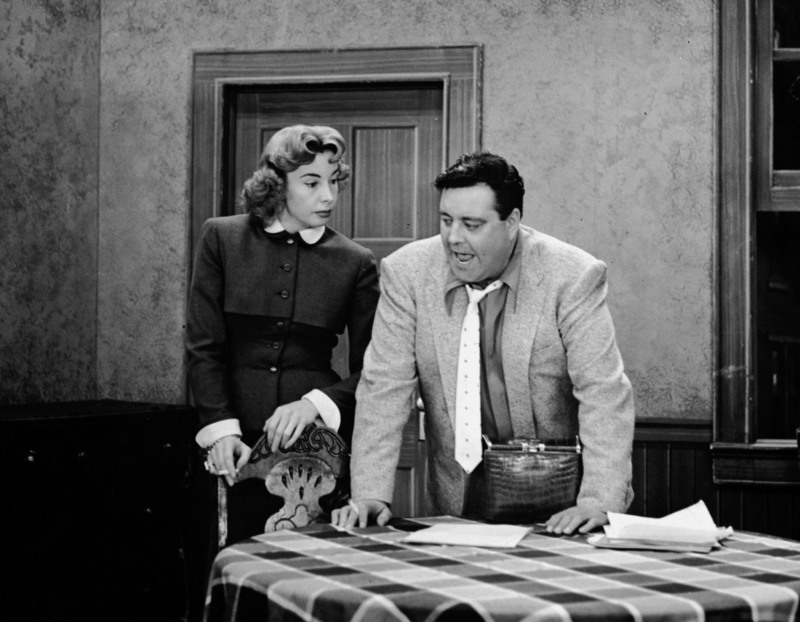 Jackie Gleason (right) played Ralph Kramden — a bumbling but loveable overweight husband — in the 1950s sitcom The Honeymooners. Audrey Meadows co-starred as his wife, Alice. About the only thing all real fat people have in common is that they weigh more. Beyond that, they are as diverse in style, background and personality as people who aren't overweight. But on the small screen, fat people get shrunk into the same stereotypes. Activist Lesley Kinzel — who blogs at Two Whole Cakes — describes the common but inaccurate mold: "Fat people are lazy, fat people eat too much. Fat people never, ever exercise, fat people are filled with self-loathing and fat people are desperate to be loved." Exhibit A: Homer Simpson. Homer's been downing donuts for more than two decades. 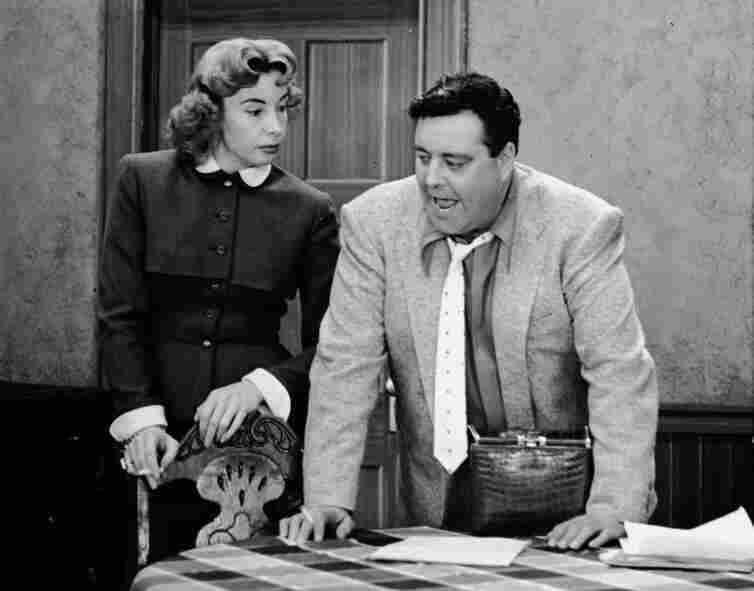 But according psychotherapist and pop culture analyst Beth Bernstein, the archetype of the "fat foolish guy" dates all the way back to the 1950s with The Honeymooners. "Ralph Kramden really started the formula of the fat bumbling man with the thin, capable, long-suffering wife that's been repeated ... from All in the Family to King of Queens and The Simpsons and Family Guy and all those kinds of shows," Bernstein says. But at least hefty guys get main roles on TV — weighty women seldom do. Take it from Kirstie Alley who played herself six years ago on Showtime's Fat Actress — furious that a bigger waistline kept her from bigger parts. In the premiere episode, she complains to an executive about Hollywood's double standards. "I mean look John Goodman's got his own show, and Jason Alexander looks like a freaking bowling ball, and how about James Gandolfino [sic], he's like the size of a whale ... he's way, way, way fatter than I am!" 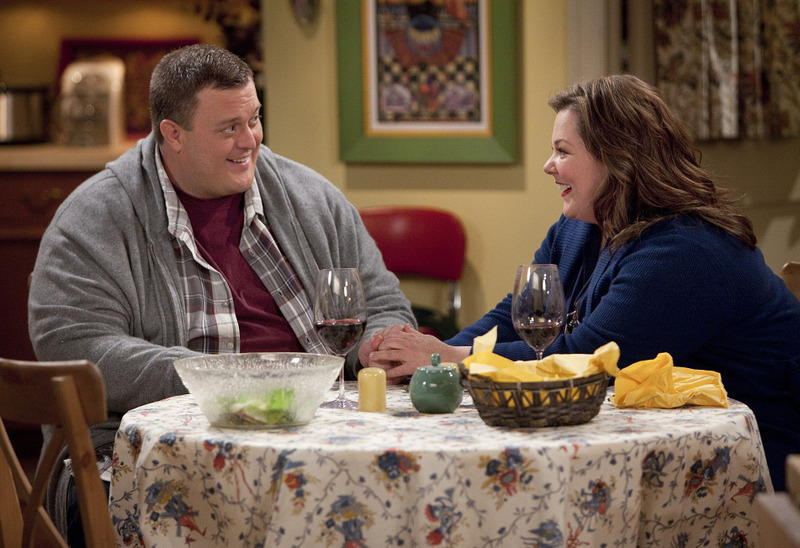 Mike (Billy Gardell) and Molly (Melissa McCarthy) meet at Overeaters Anonymous in the CBS comedy Mike & Molly. Like the fat fellas, plus-sized women tend to fall into certain stereotypes. Bernstein says they're usually the "fat, funny best friend." "[She] never has a boyfriend, is never the focus of a story, but is kind of endearing," Bernstein says. "If it's a woman of color, you have what we kind of call as shorthand ... the sassy black woman." Bernstein says that, during the '70s and '80s, bigger black actresses usually played sassy, maternal types, from the moms on What's Happening! and Good Times to Nell Carter as the feisty housekeeper on Gimme a Break. Lesley Kinzel claims TV has gotten a bit better in recent years. At least some overweight women now have romantic plot lines — like the lead character who finds love at an Overeaters Anonymous meeting on CBS' Mike & Molly. "It's a show that's trying, I think, to be a little more normalizing of fatness," Kinzel says. "But at the same time, because it's a sitcom and because it sort of depends on these short quick jokes that a huge number of people will get, one of the easiest things to joke about is someone being fat." Kinzel clarifies that she doesn't have a problem with fat jokes that are funny. "The problem is that very few of them are," she says. 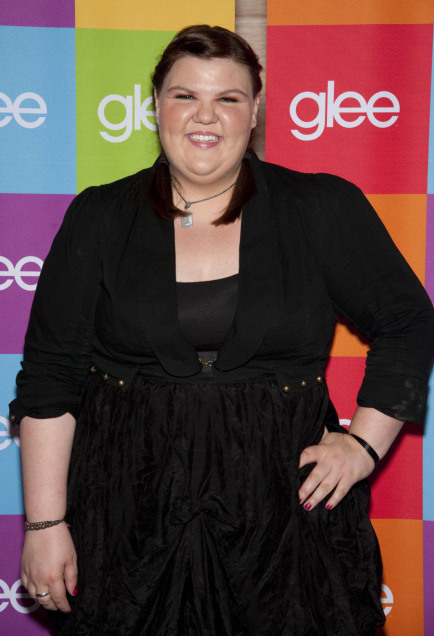 Actress Ashley Fink arrives at a Glee screening in Hollywood, Calif. Fink previously starred in ABC Family's Huge and the film Fat Girls. Every TV show mentioned in this story has been a sitcom. According to Kinzel, that's no coincidence. While it's easy to treat weight as a joke, most dramas tend to shy away from the subject. Those that approach it don't always fare well. Kinzel points to the ABC Family drama Huge about teens at a weight loss camp. It was a huge hit with overweight viewers — but didn't rate as well with the rest of the country. The network canceled it after just 10 episodes. One actress from Huge has come back on one of TV's most popular programs. 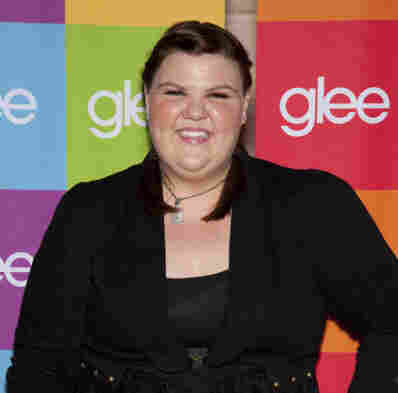 The character of Lauren Zizes is a snarky wrestler and the newest member of the singing club on Fox's Glee. Viewers were recently shocked when one of the show's hottest hunks tried to woo her with a song ... and failed. Actress Ashley Fink plays Lauren Zizes. She thinks Hollywood has gotten better at portraying fat people. But she admits she almost never comes across characters on TV that mirror her real experience as an overweight person. "I dance, I have a great time, I sing, I have great friends, I don't hide in my house because I'm large," Fink says. "I think it's unfair that that's not represented on TV." But, Fink adds, she finds sitcoms and dramas way more acceptable than reality shows like The Biggest Loser, where contestants are weighed in weekly wearing next to nothing. "Why do they have to be in sports bras and tiny shorts?" Fink asks. "It's so people at home will be like, 'Oh they're so fat, that's so gross!' You wouldn't treat animals on television the way they treat some of these people!" Aspiring contestants fill out applications during an open audition for The Biggest Loser, Season 10. More than 500 people showed up at the D.C. audition, with thousands more applying around the country. Changing Lives, Or Fueling Judgment? Pyschotherapist Beth Bernstein likens The Biggest Loser to a tent revival — where contestants repent their former, miserable fat lives and only gain redemption once they've lost weight. Take, for example, a contestant named Don who initially weighed in at 309 pounds. During an interview on the show, he expresses fear that his weight will stop him from ever having a normal life, or from being close to his son. Bernstein says TV like that can fuel the terror that people, especially those with eating disorders, have of being fat. "Who wants to be a member of a population where you are mocked and made fun of and criticized and judged?" Bernstein asks. Former Biggest Loser contestant Danny Cahill sees things differently. He says being a fat guy on TV was the best thing that ever happened to him. He's since become a motivational speaker, and he's resurrected a former career in music. Cahill says his second chance came when he appeared on season eight of The Biggest Loser and lost more than half his body weight. He says chronicling that experience on national TV sent a tremendously positive message. "In 11 months if you can go from 430 pounds to running the Boston Marathon, there's nothing you can't do," Cahill says. "That's what I want people to know — it's never too late to make a change and change your life." It's hard to dispute that The Biggest Loser has inspired Americans, says the show's creator J.D. Roth. People now pay thousands of dollars to go on Biggest Loser weight loss cruises. Each year the show is inundated with audition videos. "After Season 1, we were getting 250,000 tapes a year," Roth says. Roth is now working on the latest addition of ABC's Extreme Makeover franchise — the Weight Loss edition. The show will be Roth's fourth weight-loss reality show currently airing. He says as long as there are overweight people in America, you can bet there will be even more of these shows on TV.